Microsoft Game Studios exec Phil Spencer doesn't think 3-D gaming will catch on until systems do away with the special glasses. (CNN) -- When it comes to 3-D gaming, Phil Spencer isn't seeing eye to eye with his competitors. The entertainment industry has been placing big bets on 3-D -- it helped the latest "Jackass" sequel earn $50 million at the box office this weekend -- and that whirlwind will soon make its way to video games, thanks to Sony and Nintendo. But Spencer, the corporate vice president for Microsoft Game Studios, questions how accessible the technology is for consumers and describes recent explorations into 3-D gaming as "a science experiment." "As an entertainment company, we're trying to do things that millions of people can go enjoy today," Spencer said. "And for better or for worse, people just don't really have TVs in their house right now that are going to do 3-D in a way that's going to work." Sales of the Xbox 360 are on an upswing, jumping by 34 percent in the first eight months of this year versus the same period last year, according to data from market research firm NPD. 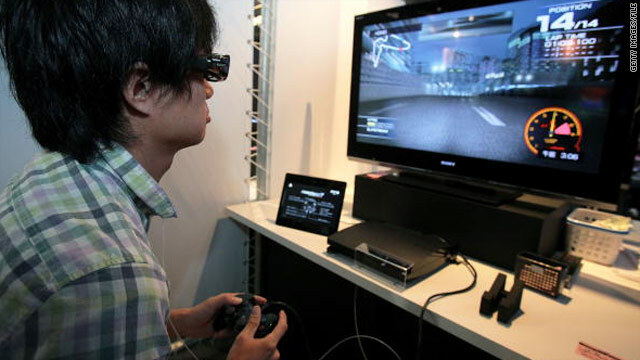 Similarly, sales of Sony's PlayStation 3 are up 40 percent. But these trends don't correlate with demand for 3-D televisions. Shipments of 3-D TVs this year will end up well below industry expectations, based on data from research firm DisplaySearch. Nintendo made a splash at the E3 expo in June with its 3DS hand-held system, which lets a player see games and movies in three dimensions without wearing glasses. At Nintendo's news conference unveiling the system, Reggie Fils-Aime, the company's president of American operations, poked fun at the notoriously nerdy glasses needed for most 3-D systems. "I like the 3DS," Spencer said, though he hadn't actually seen it firsthand. He likes the concept because "you don't have to wear the glasses." One company that is buying into the 3-D-with-glasses trend is Sony, which makes movies and TVs to work with the technology. Sony gave a glimpse of its big plans for 3-D gaming at E3, offering blockbuster games that are compatible with the technology as long as players have new, pricey 3-D TVs. But the company has yet to make that big push in the market with the PlayStation. "As a corporate mandate, I don't need to sell you a new TV," Spencer said, seemingly referring to Sony's hardware business. "That's not part of my business model. Other companies maybe have that part of their business model. I don't." For Spencer, the need for glasses could be 3-D's Achilles' heel. "A bunch of people sitting around the living room wearing $150 glasses -- I'm just not sure that's kind of mainstream today," he said. "Trying to get a bunch of people playing together in a room where not everybody sees the same thing ... is kind of a weird disconnect to me." Without enough pairs of compatible glasses, some people end up staring at a blurry screen. Not to mention there's a medical disorder that prevents some people from watching 3-D screens for prolonged periods. However, Microsoft continues its research and development programs relating to 3-D.
"If you want 3-D, 3-D games are available today on Xbox 360 and will continue to evolve," a Microsoft spokesman said in a statement. Upcoming shooters from Electronic Arts and Activision will support 3-D.
A version of "Batman: Arkham Asylum" for the Xbox 360 is available in stores and comes with a pair of 3-D glasses. "It felt a little more like a science experiment than something that's going to go touch millions of people," Spencer said of the Batman game. "Clearly, we're not going to ignore 3-D. I think it is something that will play a role in entertainment."